Check Out Our Early Bird Specials! Register by May 10 and pay last year’s price! *$549 value for summer camp, or a $799 value for the VIP package. Train here. Compete like a champion. 7-time Grand Slam Champion and Executive Director, Liezel Huber, invites you to Summer Camp! The team of world-class coaches welcome you to have fun, train hard, and improve your game. 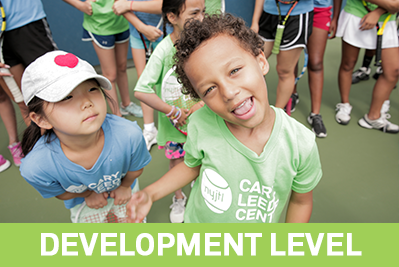 Play at the newly completed state-of-the-art Cary Leeds Center for Tennis & Learning situated in Crotona Park, conveniently located in NYC. All levels welcome, ages 5 – 18. NEW this year! Players receive one 30-minute semi-private lesson with one of our staff professional coaches for more individualized training each week. Fun, fun, fun! Campers spend the day keeping active on court, making new tennis friends, and having a blast! Low compression balls are utilized to accelerate learning and make mastering skill and technique easier. In addition to tennis training, players are offered off court activities like movie time, board games, snack time, and off-campus excursions. High Intensity! 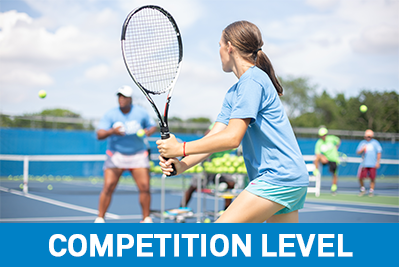 Led by an excellent team of coaches and designed for advanced players, competition level training allows players to sharpen skills, improve technique and understand high performance play strategy. Daily schedule includes tennis instruction, mental toughness training, and fitness conditioning. 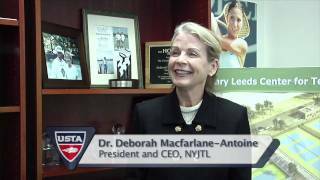 Those wishing for the most competitive training may try out for the NYJTL Tournament Team. Children can be dropped off as early as 8:00 am and picked up as late as 6:00 pm. The VIP package includes one 60 minute private lesson per week from one of our senior coaching staff, a weekly Personal Performance Development Consultation utilizing state-of-the-art sports performance technology for improved focus, reaction time, and mental clarity, plus extra court time from 7 – 9:30 am and 5 to 6 pm. Register here. New! Add on catered lunch for each day of the week for $99 per week. Register for camp, transportation, and lunch here. No makeups are allowed for Tennis Summer Camp. Refunds allowed up to 1 week before start date.